Victor Varconi was born Mihaly Varkonyi on March 31, 1896 (some sources say 1891), in Kisvarda, Hungary. He began his career on the Transylvanian stage and soon became a matinee idol with the Hungarian National Theatre in Budapest. He appeared in several Hungarian and German films before being brought to American by Cecil B. DeMille in 1923. Under DeMille's direction, the smoothly handsome Varconi played a wealthy American tin factory manager in "Triumph" (1924); had a character role as a bookkeeper in the Afterworld in "Feet of Clay" (1924); was a Russian prince in "The Volga Boatman" (1926); and Pontius Pilate in "The King of Kings" (1927). Possibly his most famous silent role was as the husband to Phyllis Haver's Roxie Hart in "Chicago" (1927). His last major silent role was as Lord Nelson in the Corinne Griffith-starring featurre "The Divine Lady" (1929). 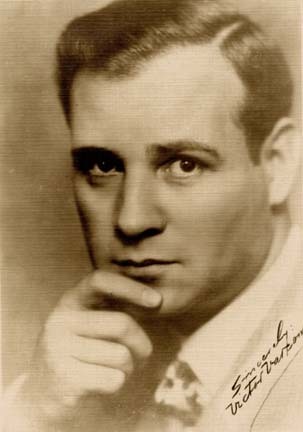 Although he had a good voice, his Hungarian accent limited his roles to character parts in talkies. He appeared in many of DeMille's talking epics such as "The Plainsman" (1936) (as an Indian chief), "Reap the Wild Wind" (1942), "Unconquered" (1947) and "Samson and Delilah" (1949). World War II resulted in a boost for Varconi, permitting him to play a variety of Axis agents. As his film career was coming to an end, Varconi turned more to stage work and radio writing. Among his Shakespearean theatre endeavors were roles in "Hamlet," "Romeo and Juliet," "Antony and Cleopatra" and "Richard III." He also moved occasionally into TV in the 1950s, then retired. Just before his death in 1976, Victor Varconi published his memoirs, It's Not Enough to Be Hungarian.